The Celestron 93535 is one of the most beneficial accessory that provides portable power for cell phones, tablets, MP3 players and other USB rechargeable devices. It also features flashlight with four large red LEDs to preserve night vision and electronic hand warmer to supply heat in chilly conditions. The 93535 can completely charge a drained iPhone or iPod, and most cell phones, smartphones and MP3 players. It delivers an output voltage of 5V 500mA, suitable for USB rechargeable consumer electronics, including smartphones. Additional features includes 4 small red LEDs to indicate battery level, and 3 small green LEDs to indicate the function setting. 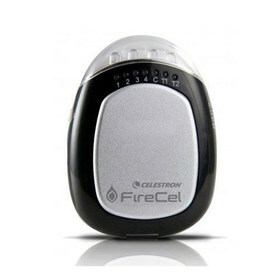 The Celestron FireCel has many exciting features for users of all types. You can extend the lifetime of your Celestron FireCel with the purchase of a FactoryOutletStore Factory Protection Plan. See the Celestron FireCel product video and gallery images above for more details. The Celestron FireCel is sold as a Brand New Unopened Item.